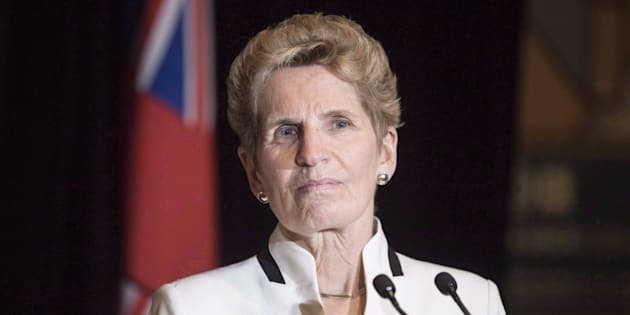 The premier of Ontario said she would continue to speak out against hate. Ontario Premier Kathleen Wynne talks to media at the Confederation of Tomorrow 2.0 Conference in Toronto on Dec. 12, 2017. BARRIE, Ont. — Ontario Premier Kathleen Wynne is defending her comments against hate crime following an alleged attack on an 11-year-old Toronto girl wearing a hijab that later turned out to be untrue. The Grade 6 student told school officials — and the media at a news conference — last Friday that a man approached her from behind and cut her hijab. Shortly after the alleged attack was reported, Wynne and Toronto Mayor John Tory called it a "cowardly act of hatred." But a Toronto police investigation concluded Monday that the incident did not happen. During an event in Barrie, Ont., today, Wynne says politicians and citizens need to speak out against hate crime at every opportunity and say that kind of behaviour is unacceptable. She says it's unfortunate when there is an incident that turns out not to be real, and has previously said she is relieved it didn't happen. Toronto Mayor John Tory has also defended his decision to speak out, saying he would continue to do so "any time there are reports or allegations of hate or intolerance in our city."